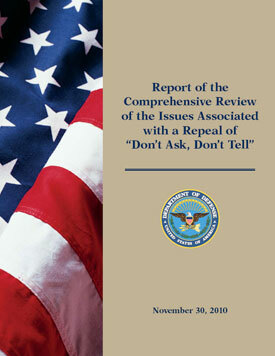 [O]ur engagement of the force was wide-ranging enough that we did answer the question of whether the U.S. military can implement repeal of Don’t Ask, Don’t Tell. To be clear, the Service member survey did not ask the broad question whether Don’t Ask, Don’t Tell should be repealed. This would, in effect, have been a referendum, and it is not the Department of Defense’s practice to make military policy decisions by a referendum of Service members. But, among the 103 questions in the Service member survey and the 44 questions in the spouse survey were numerous opportunities to express, in one way or another, support for or opposition to repeal of the current policy…. …We are both convinced that our military can do this, even during this time of war. We do not underestimate the challenges in implementing a change in the law, but neither should we underestimate the ability of our extraordinarily dedicated Service men and women to adapt to such change and continue to provide our Nation with the military capability to accomplish any mission. In the end, the review of what was could be done ended up being something very close to a referendum on what should be done. And the pro-repeal side won.